Welcome to our range of nursery outdoor play equipment. We design and make equipment specially designed for this age group with lower playdecks, easy climbs and play panels and activities. Everyone now understands the benefits that outdoor play brings in terms of physical activity, confidence building and social interaction. Even the smallest spaces can be used with an imaginative layout of playground pieces – from small city yards to open fields. We have lots of experience in creating bespoke designs and layouts for nurseries, reception classes and play groups. Do you want climbing incorporated into your nursery outdoor play equipment ? Our Meadow and Canyon Clubhouse ranges are the most commonly chosen for play areas in nurseries or a reception class play area. With deck heights of 0.6m – 1.2m they are perfect for that age group. The low deck height still gives the children a chance to excercise their motor skills . And we can add slides, gangplanks, rockwalls and all types of climbing activities to grow young muscles. But we can also design equipment to your specifications. So the play activities on your nurery outdoor play equipment can be as un-demanding or as challenging as you want them to be. ..or something gentler in Pre School Play equipment ? If you need some pre school play equipment which is less dmeanding, then what about our All Aboard range of sit-in vehicles ? They are very solidly constructed so will stand the test of time; and you can use them singly or in groups to provide a wonderful focus for imagination play. 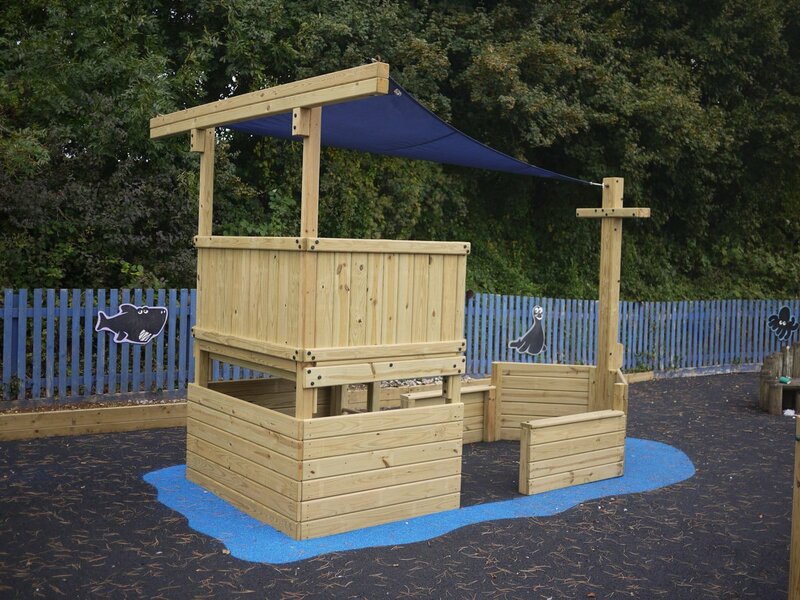 Or we have a huge selection of play panels which can be incorporated into other structures (such as our playhouses) or dotted around to provide learning and entertainment. Click on the images below to see some ideas for your Nursery or Reception Class playground.